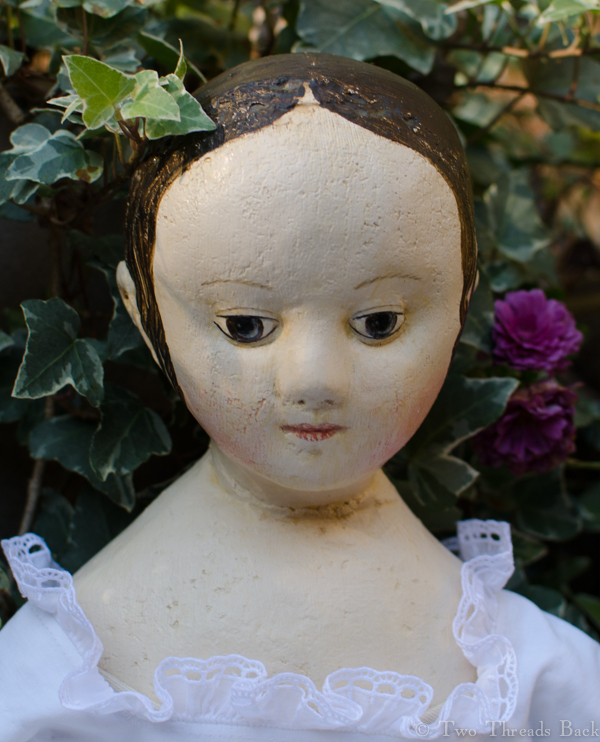 You’re never too old for dolls at Christmas! At least I’m not. 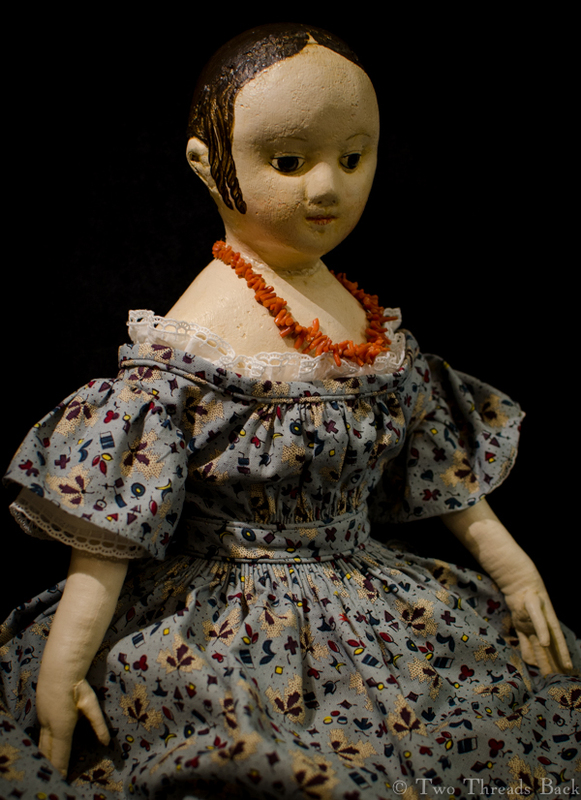 I’d like to introduce Jessamine, a lovely doll made in the style of Izannah Walker, by the incomparably brilliant artist Paula Walton. 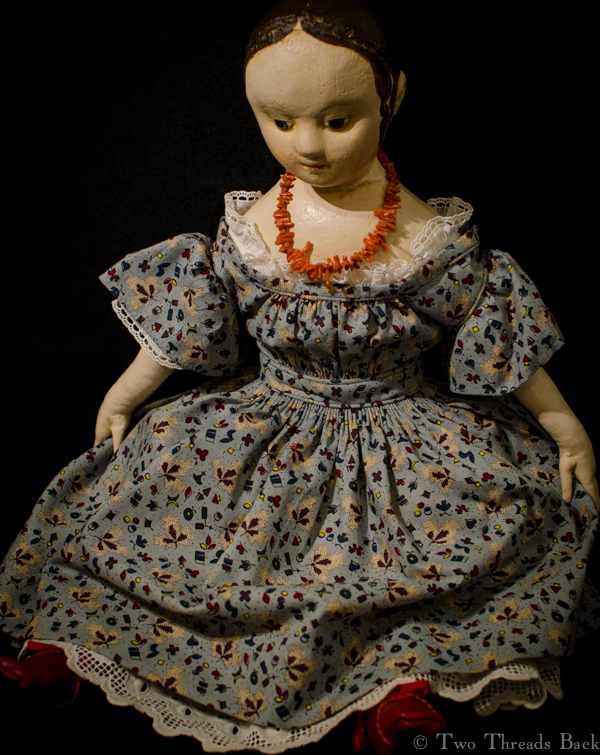 I’ve always longed for a doll like this lovely girl, and waited years before I was able to bring her home. 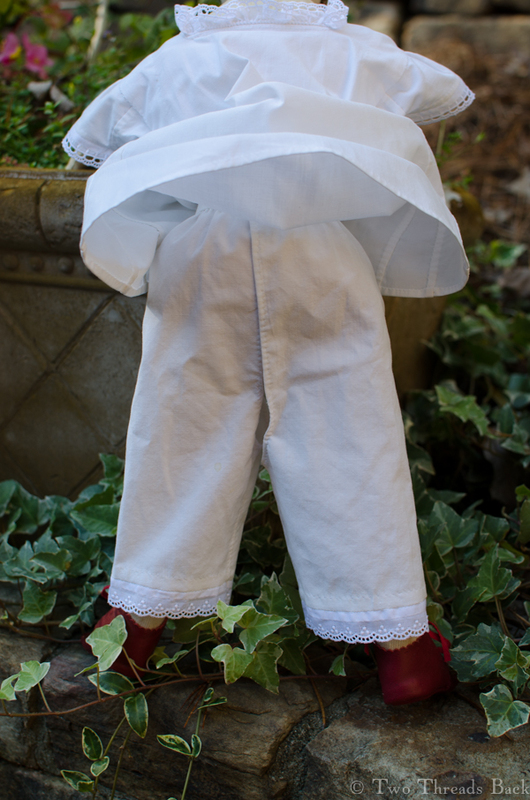 I’ve had her for a while now, but that practice waiting has served me well – because it’s taken over a year to dress Jessamine in her first (hand sewn by me) outfit! But Christmas is here and she is ready. 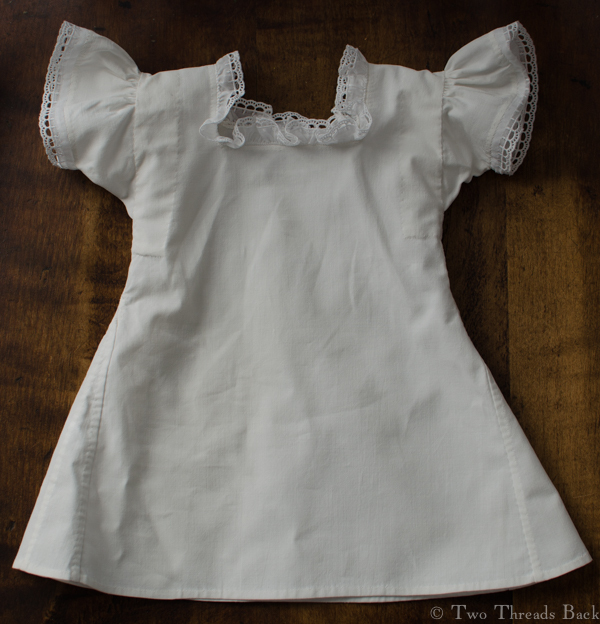 The chemise came first, and I tried to make it with the same details that a real mid-19th century young lady’s might have had: gussets, gores, and binders. I know, unless you’re used to period costume terms, they sound like instruments of torture. I guess they were, actually, for me! 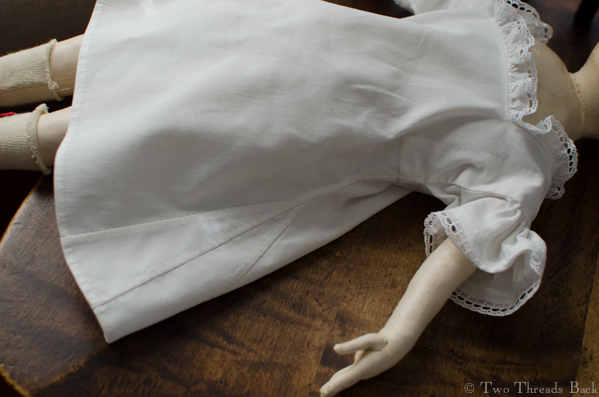 It would have been a lot easier to make a simple doll chemise, and from now on any others will be quite plain. They’ll have to be; this one is so bulky that a dress has to be specially cut to fit over it. Live and learn. Next came the drawers. Since Jessamine is an older girl, I decided she would have split rather than closed ones. Well, really I just wanted to make them that way. Of course that means it’s trickier for her to pose with them while retaining her modesty. But we managed. I suppose you can tell from the photo that this wasn’t taken in December? And surprise – it wasn’t this year, either! 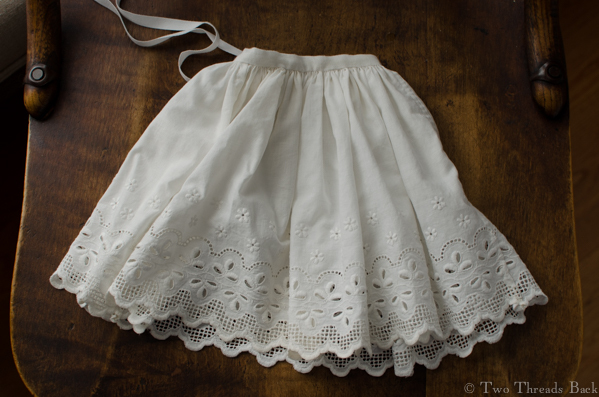 A petticoat was essential, and this one is so full that she wouldn’t need another. 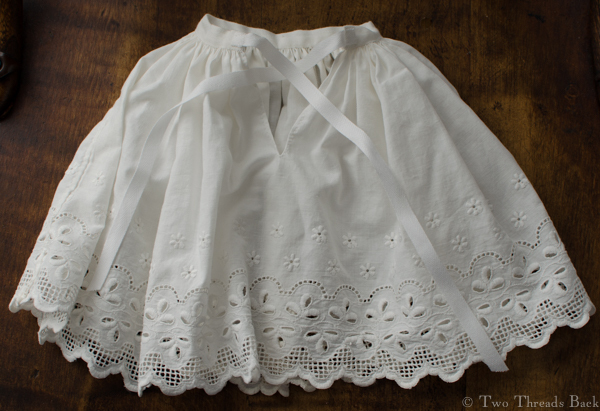 It was made from the embroidered ruffle of an early 20th century, mass-produced, low quality, damaged piece. The elderly lady I purchased it from was apologetic over its condition, saying she was told that her great aunt had stood too close to the fire. While it’s sad to take apart anything, thereby tearing it from its history, some things wouldn’t survive at all otherwise. (I’m sounding rather apologetic myself, hmm?) But now this scorched phoenix has a future and a past! Every young lady would need a corset, or if she wasn’t quite ready for that, a corded waist or stay-waist (or some other term for the same garment). Even though there are a zillion doll corsets out there for inspiration, I went exploring Cassell’s for a likely pattern. 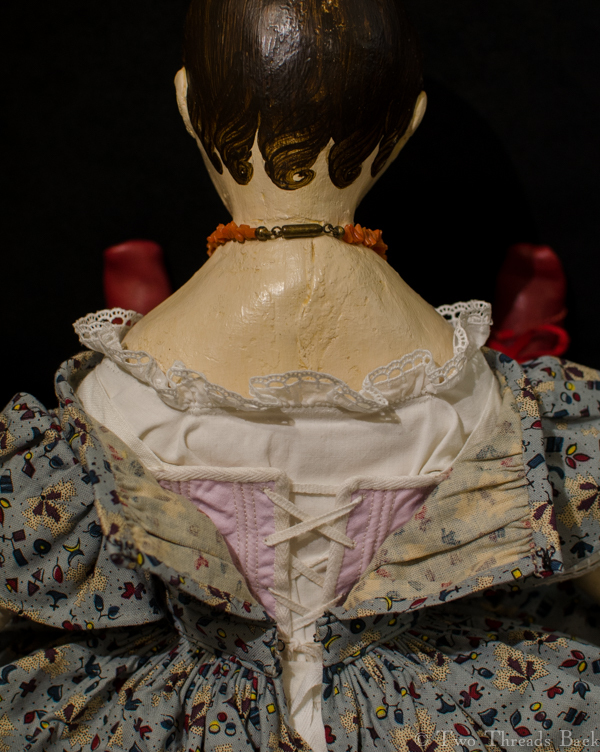 I adapted it to Jessamine’s age (@150 or so) and used the fabric from a c1900 scrapped doll corset. What girl wouldn’t love lilac stays? There was a lapse of time between the modeling session below and the actual completion of the corset. Months, maybe? But I eventually finished the eyelets and added the straps. 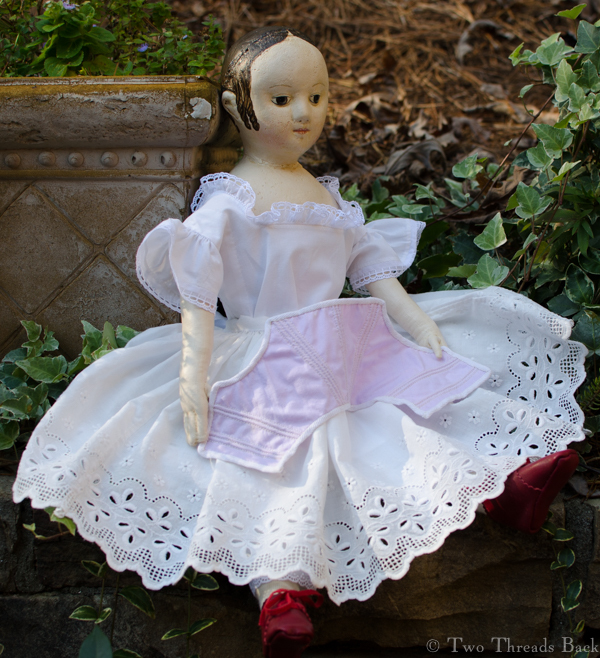 After many more months (Pharaby was taking all my time) I began Jessamine’s dress. The fabric was a happy accident: an online store sent the wrong print years ago, and it’s been in my stash ever since. I made so many mistakes that I lost count. Yep, sleeves again; one went in upside down. Aaaalll the seams and gathers had to be picked out and redone. What’s so embarrassing is that I didn’t even notice it was upside down until I’d done all that unstitching for another reason – to make the gathers match the other side. Duh. Maybe that was why they weren’t even? If you spend any time looking at 19th century portraits and daguerreotypes of children, you’ll notice that many (most?) 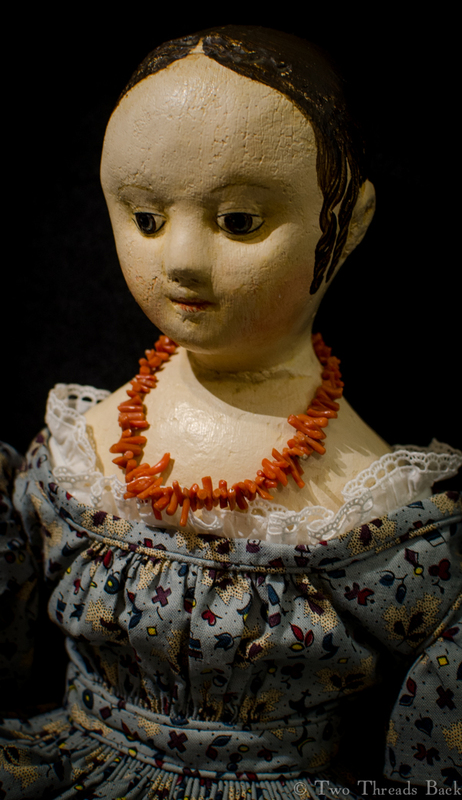 girls wore coral necklaces. I was delighted to find a bargain to finish her ensemble. It was sold as a doll necklace but looks suspiciously like a bracelet. No matter. The graduated coral pieces make it look enough like a necklace to suit us just fine. 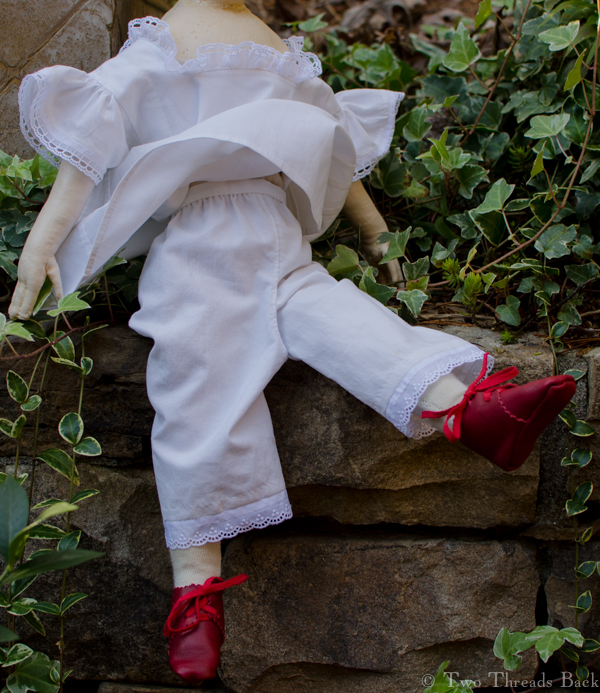 I wish I could claim credit for the pretty red shoes, but that goes to the her incredibly talented maker. 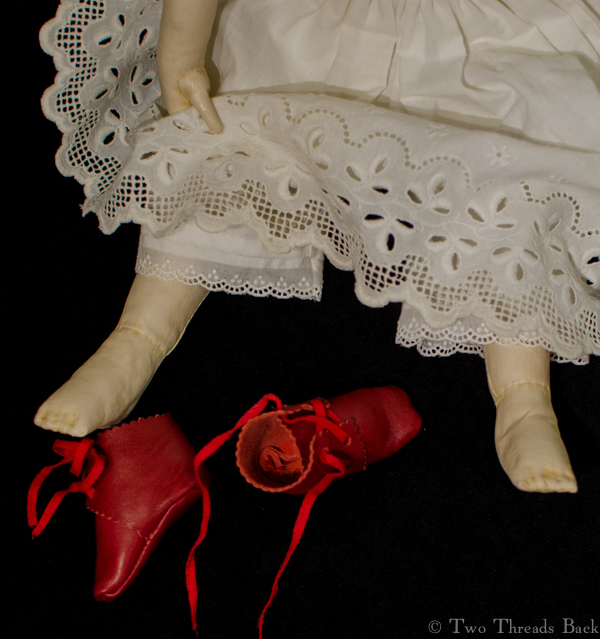 Here’s a peek at Jessamine’s feet – too sweet! Transported back to 1860 as a child, I would have been sooo tempted to take her wading in the summer! (My dolls suffered worse.) But it’s December, I’m grown up, and there’ll be no such mischief. We wouldn’t want St. Nicholas to leave only a lump of coal, would we?